This article will review the Yamaha YPT 240 by examining its build, features, sound, touch, and feel. 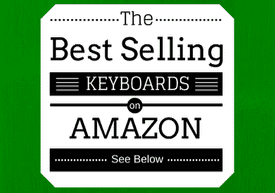 We’ll do our best to help showcase what kind of person most would benefit from this particular keyboard, and we’ll even compare it to the likes of its predecessor (the Yamaha YPT 230) as well as keyboards made by other brands (like the Casio CTK 6200). The Yamaha YPT 240 easily falls into the category of a portable digital keyboard. In my opinion, this is an option that beginner keyboard players should look for mostly because of the price point and the amount of things you’re ultimately getting for that price. The YPT-240 has (almost) everything you’re looking for when you’re just starting out. 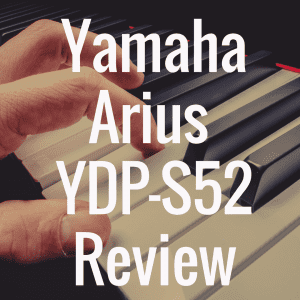 With all this being said, it should certainly be said that this is most likely not a keyboard for anybody who is on the intermediate to advanced level (if you feel you’re way passed the beginner stage, and in fact are looking for a digital piano that’s aimed more at intermediates, be sure to read our article that helps readers narrow down the top digital piano available for intermediate players). In fact, for players like that, this keyboard will be a waste of time. But if you’re truly just starting out, and if you don’t want to invest too many dollars into your very first digital instrument, then the Yamaha YPT 240 that will strongly appeal to you. 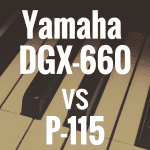 Below, please take some time to check out the interactive table below, where we compare the Yamaha YPT-240 against the YPT-230, the Casio CTK-4200, the CTK-6200 and more. When you first take a look at the YPT 240, it can be easy to get the impression that you’re just dealing with a cheap digital piano. At its essence, you can label this as what it is, but sometimes the word “cheap” can carry a negative connotation. In this particular case, I think the better term would simply be “inexpensive,” as you can find this keyboard for less than $100 online. The YPT-240 is a 61 key keyboard, so it is going to be generally smaller than a lot of digital piano builds (although I would certainly say this is ideal for beginners because it’s less complicated and intimidating due to the removed keys from the high and low end of the instrument). Personally, I think playing on a 61 or even 76 keybed is quite a nice way to learn how to play a keyboard or any digital piano. Understandably, if you’re someone who is new to a piano or keyboard and plan to take it seriously and are willing to invest more money, I say go for 88 keys. But if you’re not quite there yet, or want to use a keyboard such as the YPT-240 to sort of “test the waters,” then worry less about the key amount and more about getting a solid instrument that will help learn the basics. Also, I must note that I did not learn the piano the traditional way, so it could be said that those looking for that type of experience should, again, start out with a full range of keys (88). The YPT-240 comes in a black plastic finish, with a nice manageable interface nested in the middle. There are also two built in speakers set on opposite ends of the board, both of them being 12 centimeters and powered by 2.5 watt amplifiers. Undeniably, the best thing about this keyboard would be its portability. I have reviewed a lot of keyboards, and I really can’t remember the last time I looked at a one that weighed under ten pounds (approximately 8.8 lbs). Of course, that can be a negative for some (it’s light for a very good reason, of course, namely that its internals are not as advanced as other more expensive instruments. But again, if you’re on the beginner end of things, or perhaps you’re even interested in buying this keyboard for a very young child, I think it’s perfectly an acceptable instrument and we’ll dive more into why as this review goes along). Getting back to the weight, the lack of heft really makes it wonderful to take to a practice session or to and from school or work without feeling like you’re dragging around a heavy brick. The 61 keys also shorten the length of the keyboard considerably, setting the YPT 240 at about 38 inches, far shorter than the standard 52-54 inches you see on most 88 keybeds. When you are a beginner, I believe portability can be one of the most important components to have because you really need to practice as much as possible. And to practice as much as possible, you have to be able to take your keyboard wherever you go. I remember early on in my playing days it was painfully obvious to me when my skills had dipped after going months without playing. Many times it wasn’t my fault, it was just that because of schedule and other things, I wasn’t able to have my instrument with me all the time. And I suffered because of it. With the YPT-240, it’s nice to know that this is one problem you won’t ever have to deal with. The engineering behind any digital keyboard is going to be one of its most important components. This keyboard comes with AWM Stereo Sampling technology, which is one of Yamaha’s very basic and early sound engines. This system will do the job of effectively communicating between the different components of the machine to produce a smooth sound. There is a very basic touch response feature that will give the beginner a simple feel of how he or she can manipulate playing passages through touch responsiveness. When hit, each key is going to respond to how hard or how soft you pressed down on it. This is truly a wonderful feature for young keyboard players, as it teaches them how to flavor their music with a little bit of expressiveness. As far as the keys—well, they are certainly are not weighted (or even semi-weighted for that matter). And to be honest, they have a very plastic feel to them. But in my opinion, if you’re a beginner, weighted keys aren’t necessary, although I certainly would argue that they are much more preferable to plastic keys. But depending on your budget, as well as how devoted you are in mastering whichever keyboard you choose, plastic keys can be a perfectly fine stepping stone. The truth is, everyone has different angles on their personal trajectory as a keyboard player. And so, if you are not aiming to be a classical pianist, then perhaps weighted keys can be put off for a couple of years until you not only get the basics of playing down, but also know your own commitment level to mastering the instrument. Also, I want to mention that there are 32 notes of polyphony in the YPT-240, which should be more than enough for a beginner keyboard. The Yamaha YPT 240 has a wonderful variety of sounds to choose from when playing. There are up to 385 voices on board the machine, with a wide assortment of instruments to give each passage a different feel. The sounds on this keyboard are very solid, and I was actually surprised by how much versatility the entire selection had to offer. The instrument list ranges from grand pianos to electric pianos, organs, accordions, guitars, bass, strings, choir, saxophone, trumpet, brass, flutes, synths, percussion, and even sound effects. I have to start with the basics, one of which is the metronome. 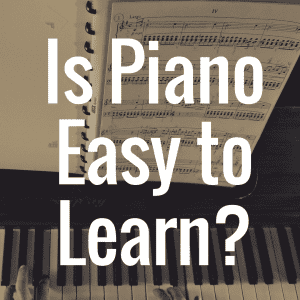 Anyone who has ever just started playing on a piano or keyboard knows that you really need something to help you keep time, rhythm and pace while you learn the keys. I’ll never forget the first time I started playing and how shocked I was at how off rhythm I could be. The metronome will really help solve this problem for you. No, it won’t replace the helpful guide of a teacher and actual lessons, but it’s a good tool to have in your toolbox so that you can know when you’re doing well, and when you need to speed up or slow down to be on rhythm. There are also a number of different effects that you can put on the voices while you are playing to enhance the color of your music. The YPT 240 is equipped with reverb, chorus, sustain, a Master EQ, and Ultra-Wide Stereo. Reverb is a well-known effect that will make your music sound like it is in a grand concert hall-well, within reason of course. Chorus gives the instrument a more full sound, as if there are layers of voices on top of each other. I love making comparisons between one instrument and another, as I feel it really gives you a understanding of what you’re working with and an accurate benchmark for other instruments within your price range. There are three important comparisons I’d like to make here when it comes to the YPT-240. First, I’d like to compare within this keyboard within the same series of digital keyboards (namely, the Yamaha YPT 210 and the Yamaha YPT 230). Then, I like to stay within Yamaha family and look at the ever popular Yamaha PSR E403, which I have personally owned for a while now. Lastly, I would like to cross brands and make a comparison to the Casio CTK 6200. Now, when first looking at the YPT 210 and 230, it is important to note that these are part of the same series as the 240, and have thus been discontinued, due to Yamaha’s efforts to improve upon the product and overall lineup. So, if any of these peak your interest, you’ll have to find them on third party websites more than likely. As expected, these keyboards have many of the same characteristics as the 240. In fact, they all have the 61 key build and frame, along with organ style keys. All three keyboards feature Advanced Wave Memory tone generation sampling, along with 32 notes of polyphony to support the voices and effects. And all three also have the same number of Accompaniment Styles (100), along with the handy Yamaha Education Suite (Y.E.S.) to help the beginner pianist learn the basics. They share the same 12 cm built in speakers with 2.5 Watt amplifiers, and they all have around the same number of voices and tones (385). The main difference between the three is that the YPT 240 has connectivity capability to the iPhone, iPad, or iTouch. Please note that you can read my review of the Yamaha YPT 230 here. The Yamaha PSR E403 is another great comparison to make. Both keyboards once again have 61 organ style keys, but they have a little bit different size and build. The E403 seems a little bit bigger to me, and it also comes in a nice sleek, silver look. Both have the same AWM Stereo Sampling, the same 32 notes of polyphony, and also the same 12 centimeter speakers supported by 2.5 watts. The big difference comes when we start talking about some of the Pro Features of the E403. There is a pitch bend wheel, knobs to control all the effects, along with an arpeggiator. The E403 also has a 6 track sequencer, which will allow you to sequence your own music if you like. As for negatives of the PSR-E403, I would say that the menus can be somewhat hard to change when it comes to the settings (there’s a lot to flip through). And, if you’re a newbie, transferring data to and from your computer could not only be a bit confusing, but you may end up feeling like it’s more of a hassle than a benefit. But with a little persistence, you can certainly figure it out. The Casio CTK 6200 compares quite well to the YPT 240, in my opinion. The CTK has more polyphony with 48 notes, more voice options with over 700 built in tones, along with more accompaniment options with over 200 rhythms. This keyboard also has a nice metronome ranging from 30 to 255 bpm tempo range, along with an amazing 32 channel mixer to go with its 16 multi track song sequencer. With the CTK 6200, you’re also getting a pretty good instrument that features touch sensitivity on its keys. And you can rest easy knowing that you can transfer all your songs, audio data, and any patterns you like through the USB port located on the machine. You can even use the included SD card slot, if you prefer transferring via that method. So with the CTK 6200, you’re never at a loss when it comes to connectivity options. All in all, the YPT 240 is a good keyboard. If you’re brand new to music, this is something that could be absolutely perfect for you. It’s tight, compact, capable of being transported around easily, and has great features for its price point. You can quickly learn the basics of playing the keyboard, while experimenting with a wide range of synthesized sounds and even learning technical musical concepts through the accompaniment features and the chord dictionary. Are there any cons? Well, yes, actually. Depending on where you purchase it, there’s a good chance your YPT 240 won’t come with an adapter or batteries (6 double A’s to be specific). And, unless you buy it from certain locations or online retailers, it might not come with a stand either. You’ll also have to purchase cables for things like connecting the keyboard to your computer or a i-UX1 cable to connect theYPT-240 to your iPhone or iPod. 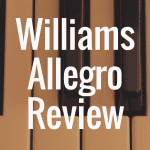 For continuously updated reviews of digital pianos, be sure to bookmark Digital Piano Review Guide, and subscribe to our weekly newsletter! 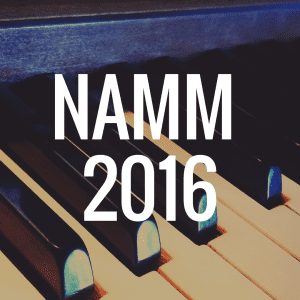 What’s the Best Digital Piano Under $500? 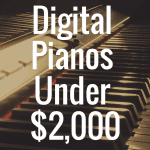 What Are the Best Digital Pianos Under $2000?